“With a loud cry, Jesus breathed his last … And when the centurion, who stood in front of Jesus, saw how he died, he said, ‘Surely this man was the Son of God.’” This is how Mark’s gospel records the death of Jesus. These are surely two of the more wonderful and mysterious verses in the whole of scripture. How is it that the Son of God dies? What was it about Jesus’ death that prompted the Centurion’s profound statement? As I stand before David Mach’s Die Harder I am immediately struck by the immense size of it. The body is full and strong; it is brimming with energy and tension. His muscles are taut and the expression on his face is not simply one of pain, but also one of determination and zeal. I approach the sculpture and on close inspection I can see that it is hollow. Small holes attract my gaze and I want to look inside. The body begins to lose its substance as I am aware of its hollowness. 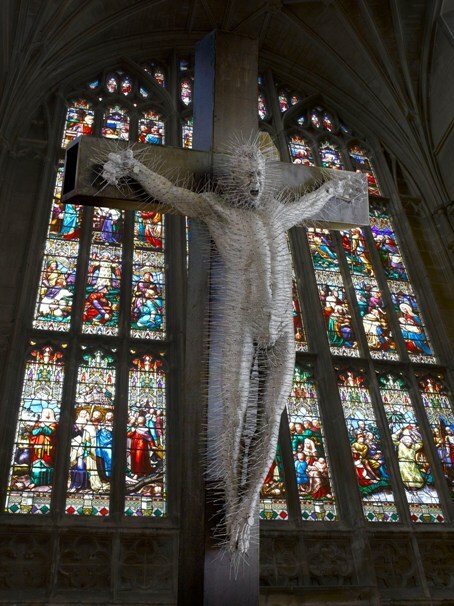 This Jesus is a shell – metal wrapped around air – and I wonder if he also will cry out and expend his last breath for all humankind, even for me. And then, of course, there are the prickles. 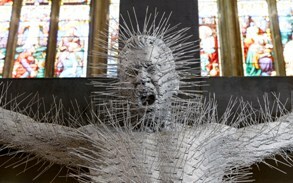 Jesus’ body is covered in spikes which define him as both tortured and alive. Mach achieves this effect because he has constructed Die Harder out of hundreds of coat hangers. He has made other sculptures out of coat hangers, but in these he often leaves the ‘hanger’ part curved. In these instances the coat hangers create a soft texture, something like fur, but in Die Harder the effect is exactly the opposite. Like Saint Sebastian the spikes appear to pierce Jesus’ flesh and to accentuate his suffering. But there is also another way to look at this feature of Die Harder. The spikes might also be said to radiate out from Jesus’ body, charged with energy, and like lightning rods they await a spark to set them aflame. The significance of ‘coat hangers’ should not be lost upon us. Jesus is, after all, the one who hangs upon a tree. These coat hangers – these mundane materials – remind us that Jesus had a body like everyone else’s. His body was also subject to gravity, that most universal of all forces which shapes the cosmos and leaves its impression on all things malleable to its warp and weft. But Jesus is also portrayed in the New Testament as one who has cosmic forces of his own: the man who hangs upon the tree is the same man who calms a raging storm. Paul writes: “The Son is the image of the invisible God, the firstborn over all creation. For in him all things were created: things in heaven and on earth … He is before all things, and in him all things hold together” (Col. 1:15-17). In the death of Jesus one is confronted with the wonderful paradox that the one upon whom all things hang is himself hanging upon a tree. And this cosmic sacrifice of the Son is an offering to the Father, as Jesus invites all to hang their sins upon him so that they may be clothed in his own righteousness. Mach does not claim to be a Christian and it is unclear whether Die Harder has any religious significance for him. Mach even admits that his knowledge of the Bible comes solely from stories he heard as a child. As a result some might find it difficult to view Die Harder within a devotional context. But, as the foregoing reflections suggest, I believe that one can view Die Harder as standing within a long line of crucifixions that challenge people to find their God hanging on a cross. How is it that a son of God dies? His death is the same as so many other deaths and yet it makes all the difference in the world. Die Harder helps us to reflect a little more deeply upon the Centurion’s remarkable statement and to enter a little more fully into the mystery of Christ crucified. David Mach, Die Harder, 2011. Born in Methil, Scotland, in 1956 Mach graduated from the Duncan of Jordanstone College of Art (Dundee) in 1979. Mach has been nominated for the Turner Prize (1988) and he is a member of the Royal Academy of the Arts. His work has been exhibited internationally in such locations as London, Dubai and Hong Kong. Mach's current show in Edinburgh, titled ‘Precious Light’ is inspired by the King James Bible, and it includes an installation of Die Harder. James Watkins is completing his PhD in theology at the University of St Andrews on comparisons between divine and artistic creativity and the effect they may have on the artist’s creative practice. He also holds an M.C.S in Christianity and the Arts from Regent College, Canada and a B.A. in Studio Art from Wheaton College, USA where he concentrated in painting. James also regularly contributes to the blog http://www.transpositions.co.uk/, which explores the relationship between theology, culture and aesthetics.